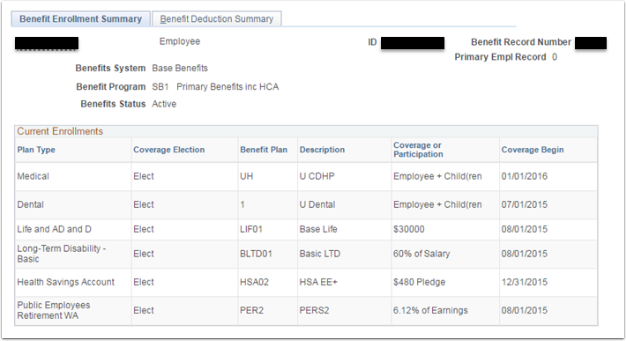 Purpose: Use this document as a reference for viewing employee benefit information in ctcLink. PeopleSoft is the origin of entry and system of record for the following benefits. Enter the EMPLID in the Search Criteria section. 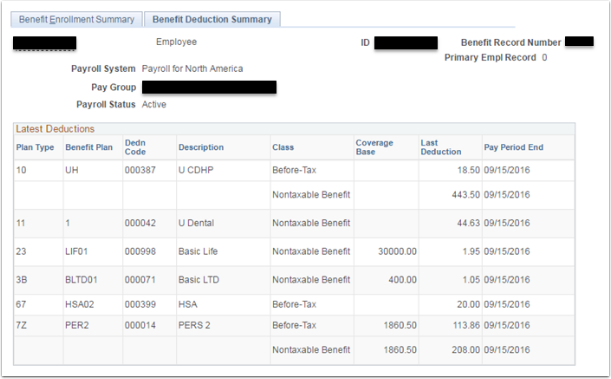 Click the Name of the employee to navigate to the Benefit Enrollment Summary page. View the employee’s benefits in the Benefit Enrollment Summary tab. Coverage Begin date drives display, if entry in PeopleSoft or Pay1 (which comes over to PeopleSoft) isn’t consistent with PeopleSoft’s needs then the Coverage Begin date may not represent the most current effective date. The Enrollment tab will pull the highest effective date only in Coverage Begin, even if the Deduction Date has a later effective date. Misunderstandings can be circumvented by making sure that the Coverage Begin Date always equals Deduction Begin Date as in the example (and that this entry is also done in the fields mapped from Pay1 into PeopleSoft).